I am the son of Dr Ted Malfair, a retired Kelowna specialist in Internal Medicine, and Amelia Malfair, a retired public health nurse. I have two brothers: David and James. I grew up here in town until graduating from KLO in 1987 and moving to UBC Vancouver to further my studies. During my 10 year stay at UBC, I completed a BSc in Microbiology in 1991 and a DMD (Doctor of Dental Medicine) in 1997. I was a member of the UBC Varsity Rowing crew while there. After practicing dentistry for 5 years on Vancouver Island, I returned to my roots by coming back to Kelowna with my wife Violeta in 2002. We have since had two wonderful sons (Dominic and Julien) and enjoy an active family life including cycling, swimming, golfing, skiing, basketball, soccer, paddle boarding and travelling. All of us love it here in this wonderful community and are all very involved in life here. In 2002, I decided to takeover my childhood dentist’s, Dr Al Labounty’s, practice following his retirement. 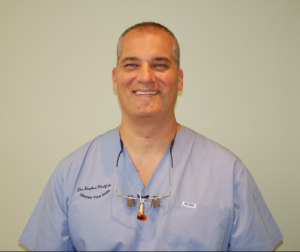 I am very passionate about dentistry and continually strive to learn and improve my knowledge. Together with my dedicated, caring and highly skilled staff, we work hard to provide world class dental care. This focus on achieving great outcomes flows from our focus on great listening and communication with patients. You will be heard and well cared for in my dental practice.